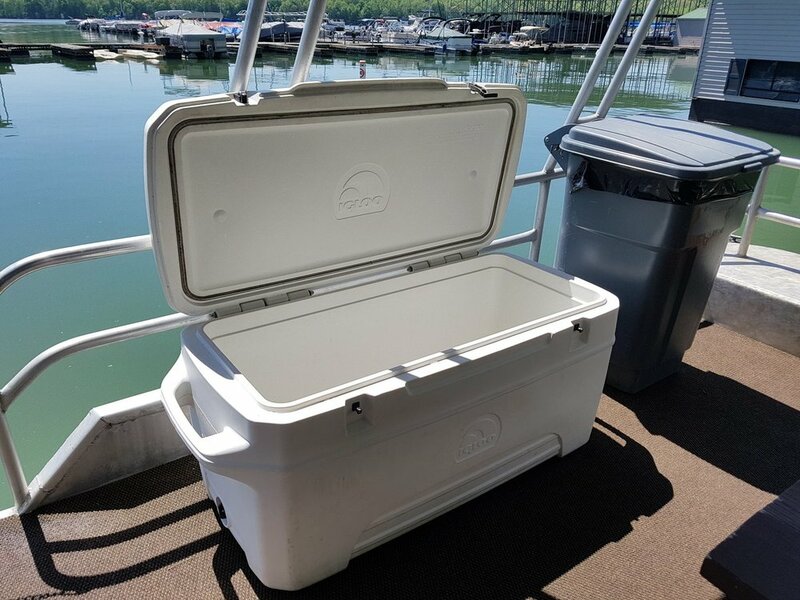 Check in at the Floating Store at the marina, approximately 3 miles inside the main gate entrance (Newton-Stewart) to Patoka Lake. DNR gate fees apply. Don't forget to get any last minute supplies at Patoka Station before heading into the park. 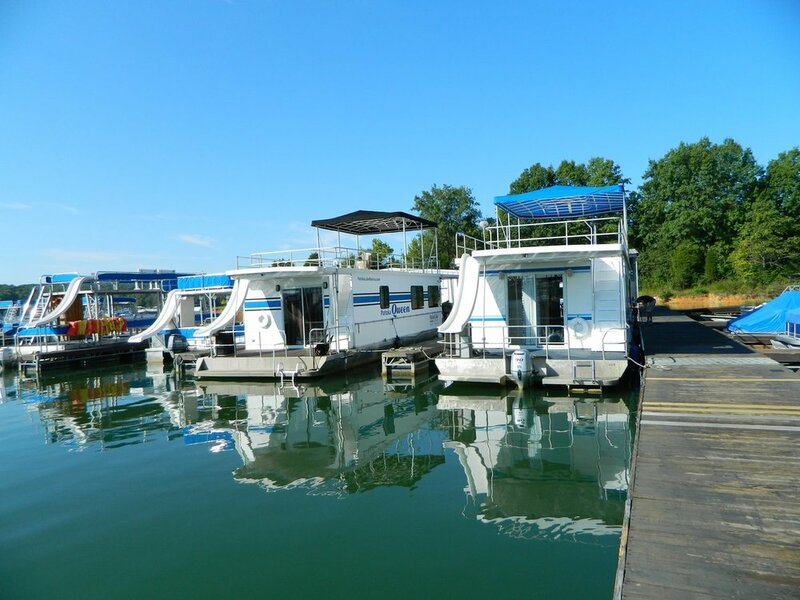 Call to reserve your 6 or 4 bedroom houseboat rental. Availability can be seen online. Reserve the houseboats for a whole week to save the most money. Also enjoy big savings in April, May, September & October (see Special Deals). 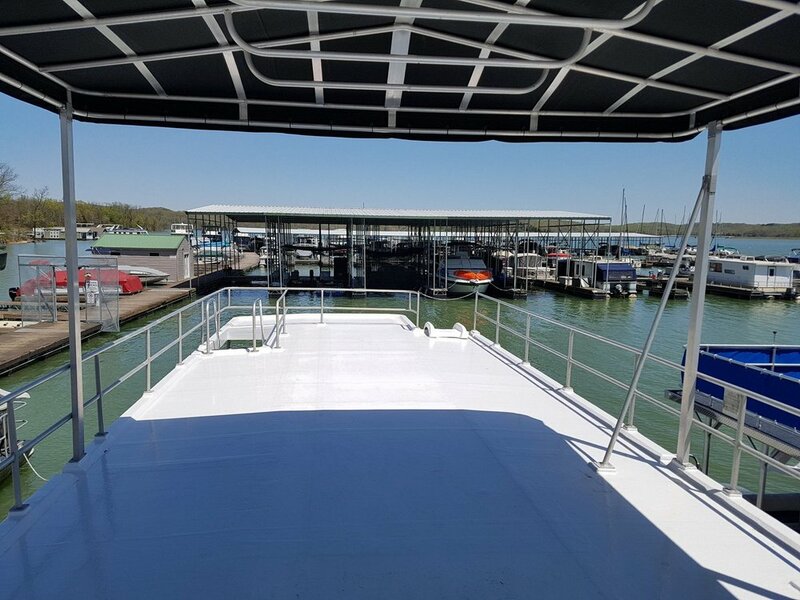 Houseboats have a 100 gallon water tank, so you may need to return to the dock to have the tank refilled during your stay. Queen & Princess prices are for up to 8 people. Admiral prices are for up to 12 people. * Summer prices are in effect May 16 through September 9. Taxes and fuel not included in prices. 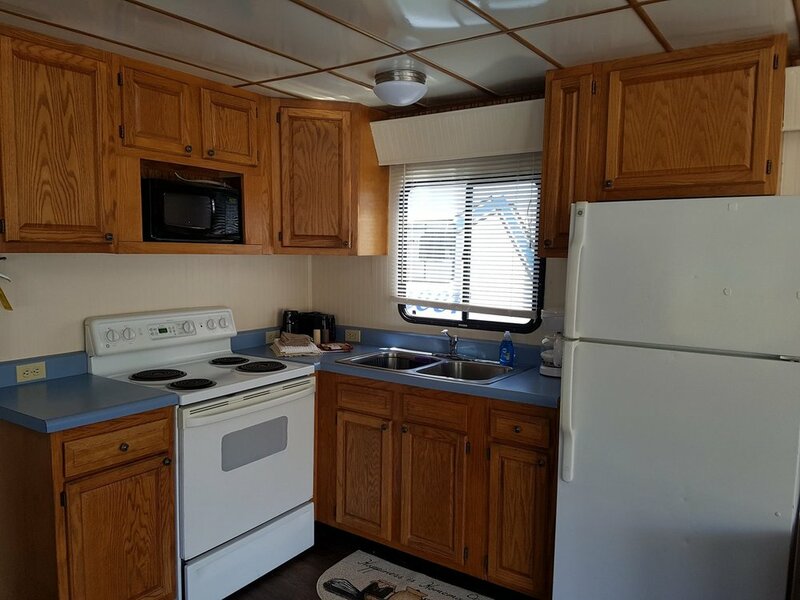 There is a required houseboat deposit of $500. The Princess is on the right with the blue awning. The living area, dining area and kitchen are all open, making for a spacious gathering area. The full kitchen (with microwave and coffee maker) comes fully equipped with all cookware, dinnerware and utensils. The open living area looks out onto the covered front deck, which has a cooler, picnic table and gas grill. The dining table doubles as a great game table. The driver’s seat and steering wheel, also located in the main living area, looks out over the front deck. This is a double cuddy cabin, so underneath the first 2 state rooms are 2 more state rooms, each with a full bed. There are 2 toilets with 1 shower in between them. The toilets close off from each other and the shower. The top deck provides shade, sun and access to the slide. Remodeled inside and out for 2018! 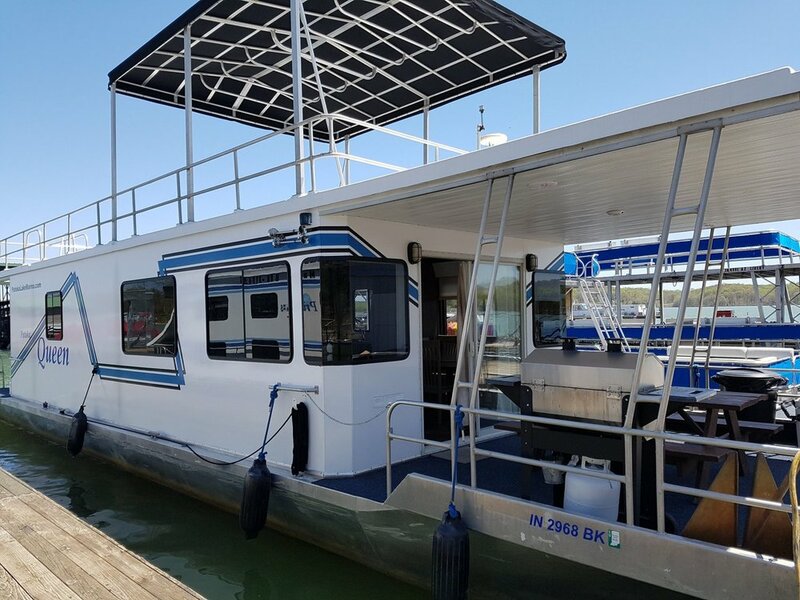 This houseboat has 4 state rooms with full beds. It’s a double cuddy cabin, so 2 state rooms are directly beneath the other 2 state rooms. The front deck features a cooler, gas grill and picnic table. The living area is also open to the dining area and the full kitchen. 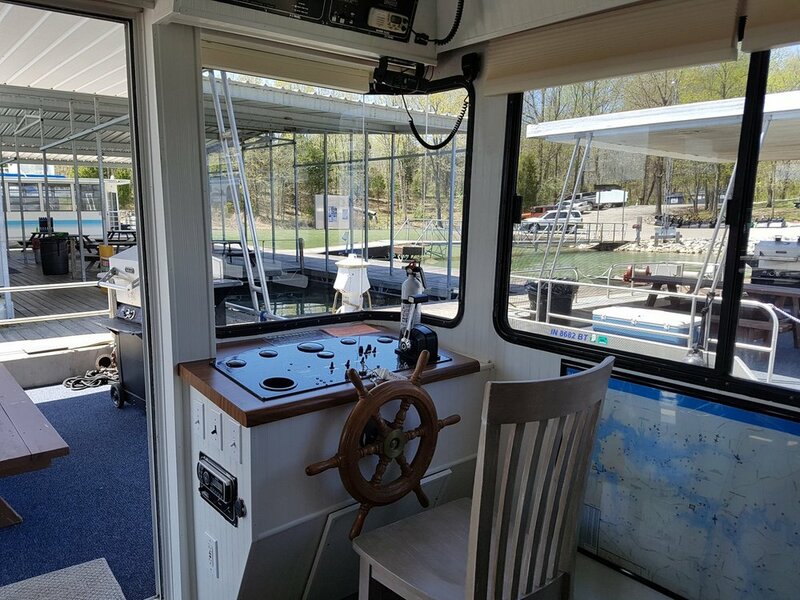 The driver’s seat and steering wheel are also in the main living area, looking out over the front deck. There are 2 upper state rooms, each with a full bed. There are 2 lower state rooms, each with a full bed. 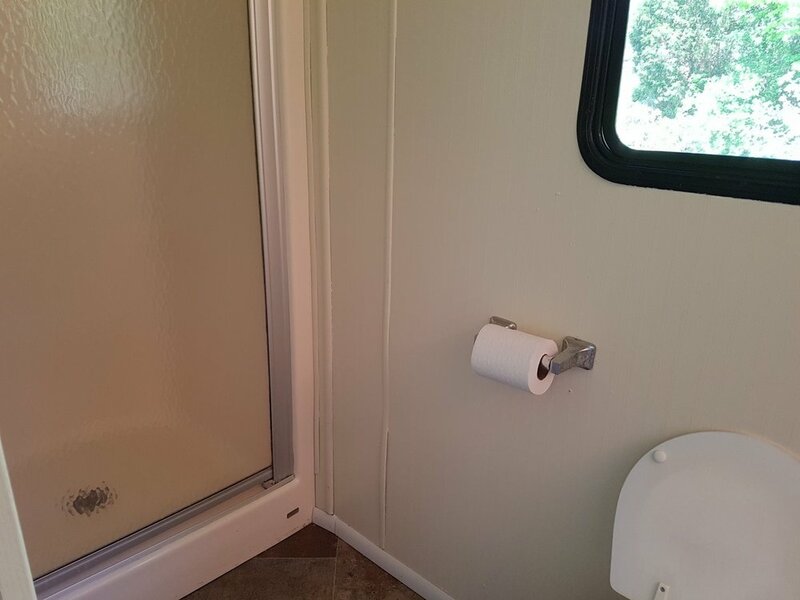 There is one full bathroom with a shower. The top deck provides areas of sun and shade. The top deck also provides access to the slide. This houseboat can also serve as a floating cabin when it stays docked. The large covered front deck holds a large cooler, a picnic table, and a gas grill. The living area, dining area and kitchen are open to each other. The full kitchen comes fully equipped with all cookware, dinnerware and utensils. Just bring your own food. The main hallway to the state rooms, bathrooms and back deck. There are 3 upper state rooms, each with a full bed. There are 3 lower state rooms, each with a full bed. Bring your own linens. There are 2 full bathrooms. 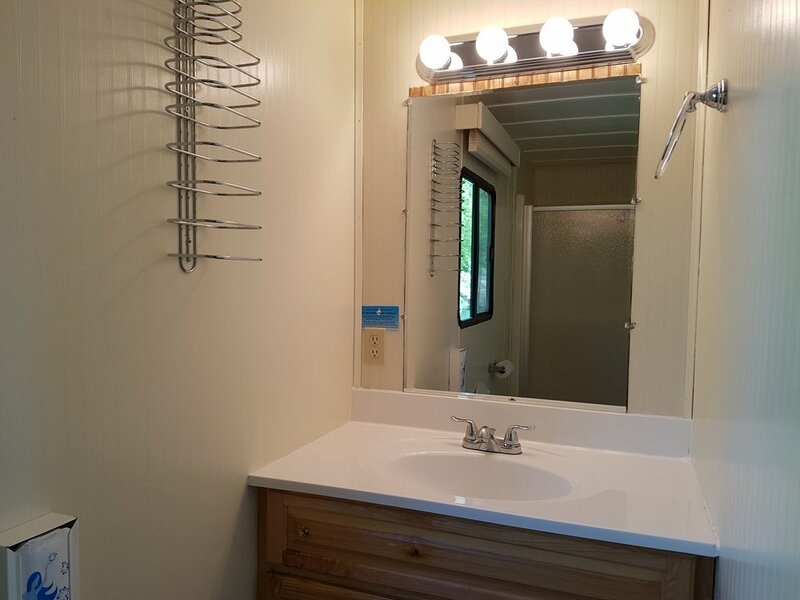 Each of the 2 full bathrooms has a shower stall. The top deck has an awning providing some shade. Boarding the boat will not be permitted until the contract is signed and all fees are paid. The person who made the reservation must be present for check-in and check-out. All boats must be in and unloaded before 10 am. There will be a $50 fee and a $35 per hour late charge. Please remember that someone else will be waiting for the boat. We must be made aware of problems such as dead batteries, etc. when they occur. 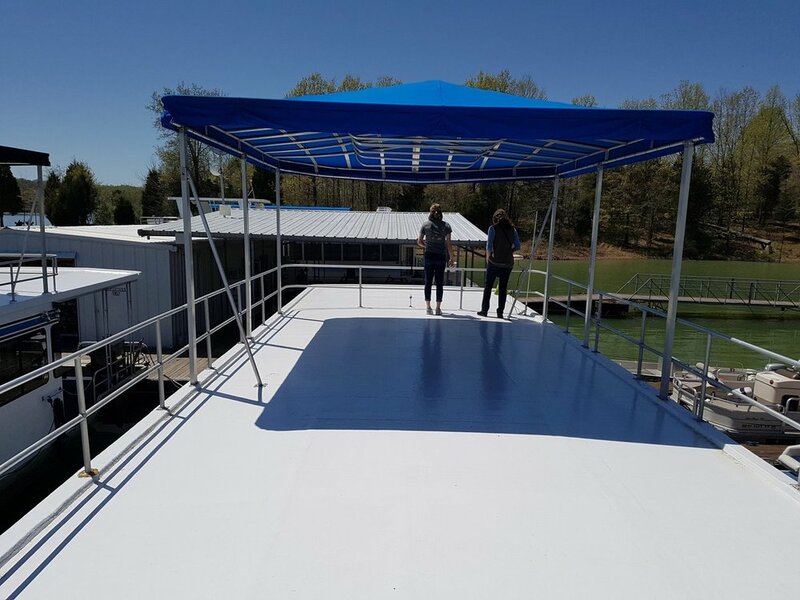 Patoka Lake Marina will not be responsible for time lost due to mechanical problems or failures. Check in time for the boat is 4 pm. You have to be loaded on the boat and ready to leave the marina by 6 pm in order to reach a safe cove to tie up for the night. If you are not ready to leave by 6 pm you may have to spend the first night in dock. Houseboats are not permitted to operate after dark. There is to be no towing of any kind with the houseboat. This includes but is not limited to fishing boats, jet skis, canoes, etc. Please do not leave dirty dishes or trash on the boat. Please remove all of your trash at the end of your rental. There is a trash dumpster located in the parking lot of the marina. It is illegal to be forward of the handrail while the boat is in operation. It is unsafe to swim near the rear of the houseboat with the generator running. It is unsafe to tie another watercraft up to the generator exhaust side of the houseboat. YOU ARE RESPONSIBLE FOR THE FUEL THAT YOU CONSUME AND WILL BE CHARGED FOR IT. You are to pay for the fuel upon returning to the dock. At that time the dock personnel will go over a final check list of the boat with you. You are responsible for the boat. If any damages would occur during your rental, you are financially responsible. YOU MUST NOT GO UNDER ANY BRIDGES. Do not allow anyone to dive from the top of the boat or to go beyond the railing on boat tops for any reason. PETS ARE NOT ALLOWED ON ANY OF OUR HOUSEBOATS. If you require picking up any additional guests during your outing, please schedule pick up after 11 am and before 4 pm on weekends. The traffic of boats arriving and departing is heavy. Scheduling during the times mentioned (11 am - 4 pm) will allow us to give you our full attention. You agree to indemnify, defend and hold harmless Patoka Lake Marina, Inc., its owners, employees, consultants and agents from any and all third party claims, liability, damages and/or costs (including, but not limited to, attorney fees) arising from your use of the Patoka Lake Marina, Inc. Product and Services, your violation of terms of Services, your infringement, or infringement by any other user of your account, of any intellectual property or other right of any person or entity. You agree to immediately notify Patoka Lake Marina, Inc. of any unauthorized use of your account.